"The B10 camcorder has a candy bar shape with a front-facing lens -- much like the Flip camcorders that kicked off the pocket cam craze in the first place. The B10 shoots at Full HD resolution, snaps 16 megapixel stills, has 16X digital zoom, and takes SDXC cards as large as 64GB. Prefer the ole' pistol grip? The P100 boasts the same specs and adds 8X optical zoom -- still a rarity in inexpensive pocket cams." 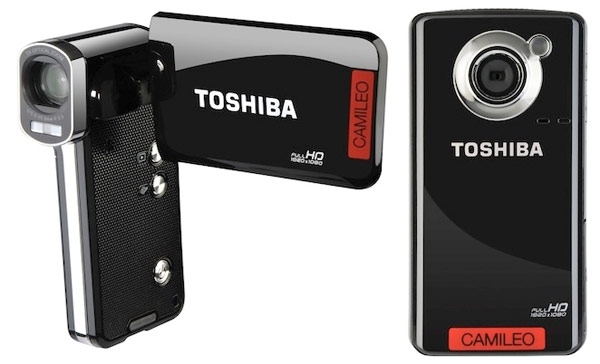 If you are not in an immediate hurry to purchase and can wait until sometime in the second quarter, these two Toshiba pocket camcorders may be well worth having a look at if the form, functionality, and specifications meet your needs. Both the candy bar-styled CAMILEO B10 and the pistol grip-styled CAMILEO P100 will capture video at 1920x1080p (30p) and can capture 16 megapixel still shots (interpolated from their 5 megapixel (B10) and 8 megapixel (P100) CMOS image sensors). The P100 does have a full 8x optical zoom capability for video (5x optical zoom for photo stills), which is a significant advantage over the B10 which just has a digital zoom. Both models capture MP4 video and JPG still photo formats, and both models have Mini-HDMI and Mini-USB 2.0 ports for connectivity.